In the last post, I glossed over the bit about how lightning has a hard time passing through air, so I thought I’d clarify (and hopefully this’ll be clear enough that I don’t need to keep up with this string of addenda and clarifications and can write about something new). The green lines represent the electrical field. Of course, the force experienced by a charge dropped into a field depends on the sign (positive or negative) of the charge. A negative charge will experience the opposite force that a positive force experiences, ie, the arrow heads all point in the other direction. 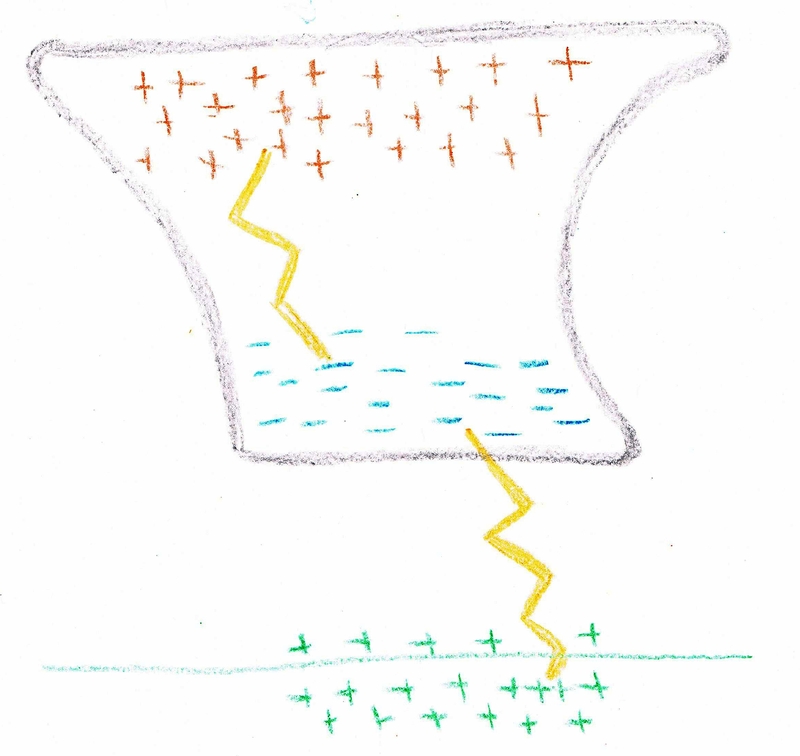 With lightning, it’s not a point test charge dropped into the cloud that creates the bolt, but rather that the charge distribution itself cannot be sustained any longer, and a bolt transfers charge from one region of the cloud to another and neutralizes the field. The bolt travels through air, and air is not a vacuum, so the physical properties of the air (or any material that charge is attempting to move through) will affect how easily the charge can move through the material. Materials (and by materials I mean any state of matter, so it can include say glass, water, and air) can generally be classified as either insulators or conductors, depending on a property called conductivity. Electrical energy has a hard time travelling through insulators (like glass) which have a low conductivity, while it passes easily through conductors (like metals), which have high conductivity.